So Rosie has finally begun to master some words. In fact, she has a sentence she likes to repeat... over and over and over. You may be surprised, it is very out of character for her. Get ready for it -- "I do it Mama' - but it sounds like "I dod it mama". Imagine! 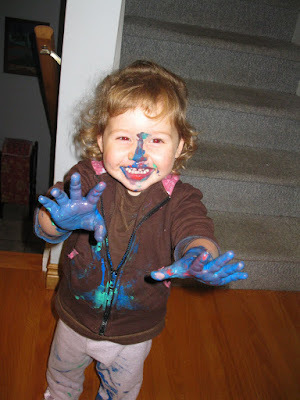 This picture shows Rosie after getting into some bottles of paint that she found while Mommy was getting ready for dinner. Yup, she did it alright!